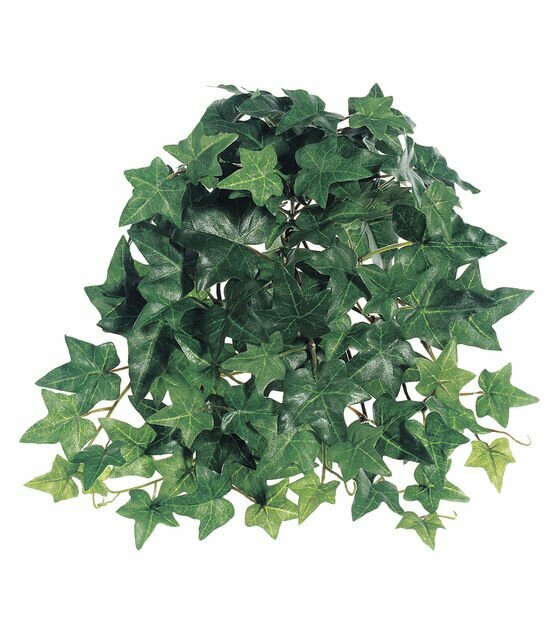 *Attach fake leaves with eye lash glue. *Green lipstick and eye shadow. *Dark black eye liner and fake eyelashes. Hey Party People! 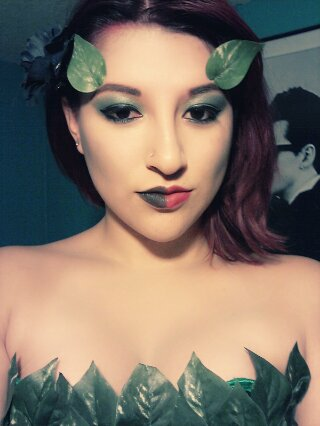 So today my friend Cassandra and I attempted to make a poison Ivy costume. That is Cassandra pictured above. I think it went pretty well! First we watched a ton of YouTube videos on how to make the costume. The one we felt worked best for us, was a video from Slim Goody. I recommend watching it. Then we had to weigh the costs vs the benefits. NO ONE AT THE PARTY WILL BE WEARING YOUR COSTUME!!!!! Unless you already own all the needed materials, it may cost you more than purchasing a store bought costume. In our case being unique out weighed the cost. Buy it a size bigger than you normally wear. Once you hot glue leaves on, the fabric does not stretch as well and is constricted. We purchased this corset and Tutu at a novelty costume shop (Sweet Island, Chino, CA) for $19.99 each. We cut the leaves from the stems and organized them by size. (Tip: We found that the small leaves worked the best. 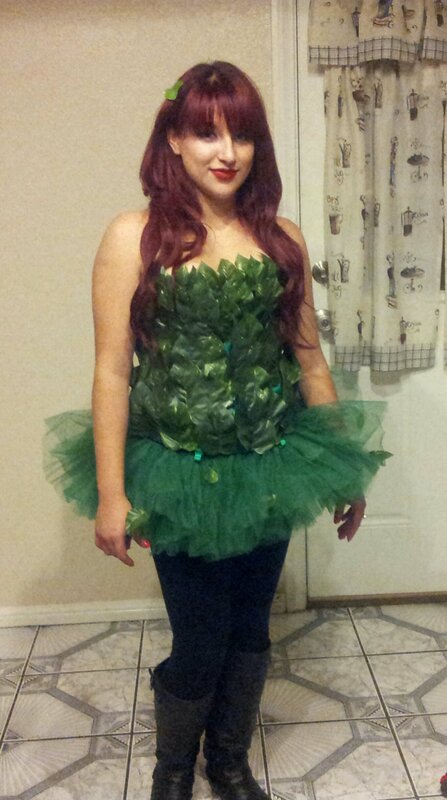 Once the corset was actually worn, the bigger leaves didn’t work as well around the curves.) 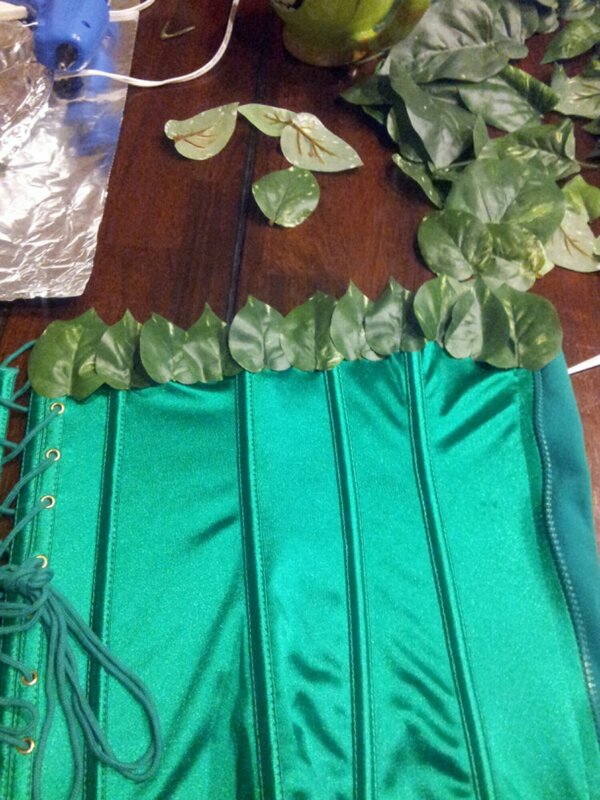 Next we used the smaller leaves and started to hot glue them to the corset. We did one row at a time, starting at the bust and then layered them down. It looked best when the leaves were overlapping. 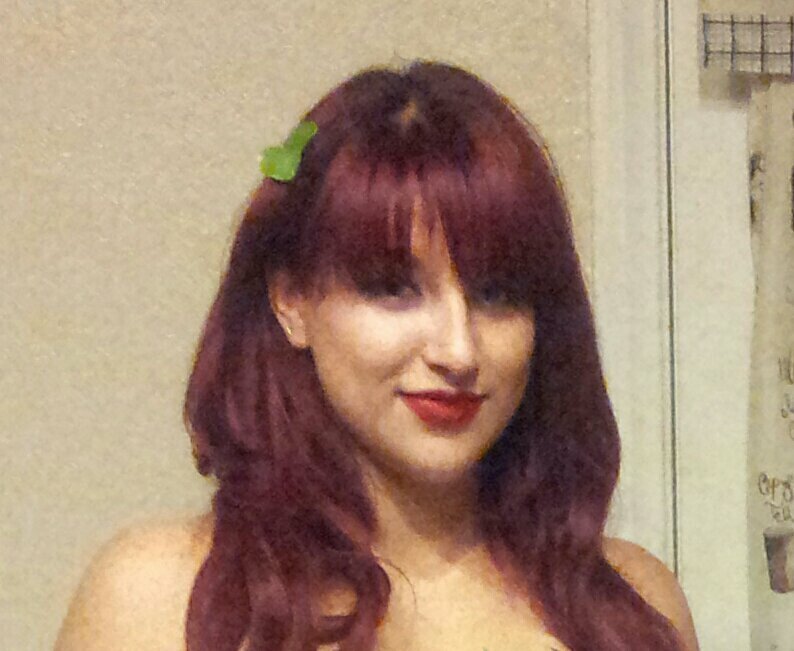 (Tip: Do not glue leaves onto the actual boning of the corset. Try to get the glue from the leaves in between the boning). 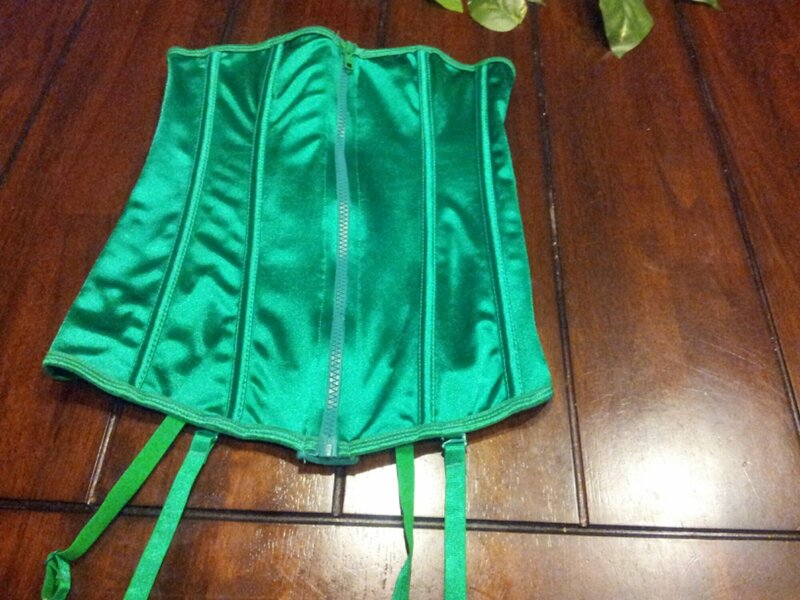 Once you are a few rows deep, try the corset on, look for gaps or any odd looking sections. Better to fix now, then after it is all glued down. Continue layering until you reach the bottom of the corset. Try it on again to look for gaps. We found the most gaps occurred in areas that curved, like the bust and hips. 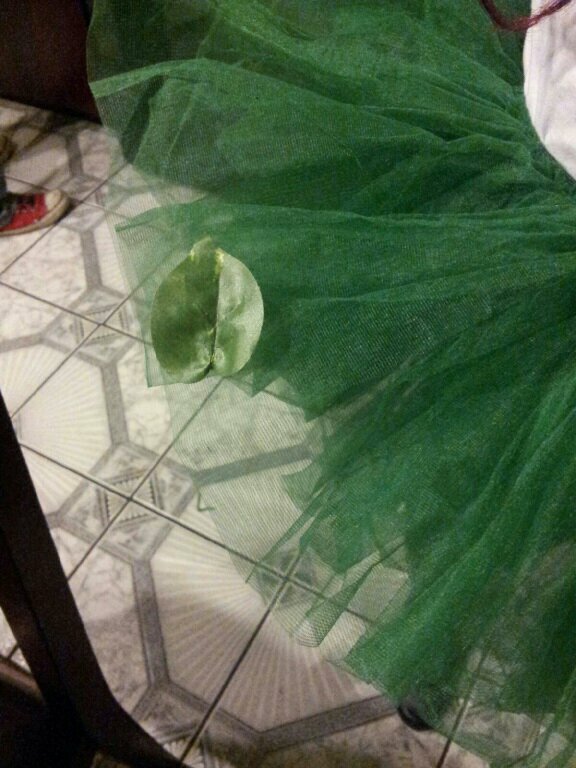 Add small leaves to random areas of the tutu. Keep this area light on leaves. Too many is overwhelming and not as cute. 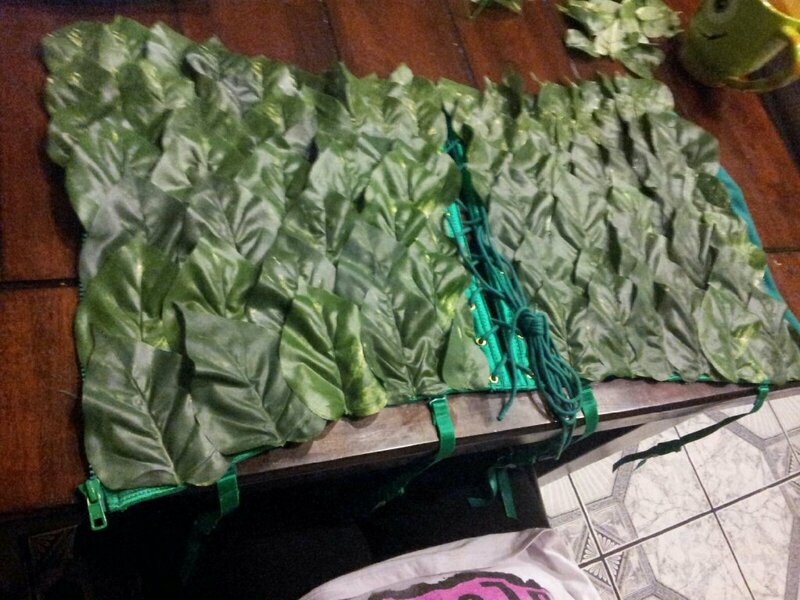 Beware letting the layers of tulle touch when adding the leaves. You don’t want it to clump together. If the tulle of your skirt is wrinkled, leave the tutu in the bathroom while you’re taking a hot ahower. The steam will let the wrinkles out. Or if you have a steamer, use that. Use a tiny bit of glue and add a small leaf to a bobby pin for an easy hair accessory. Then all you have to figure out is if you will wear leggings and what shoes to wear! I will leave that up to you. I hope this was helpful. We will be posting themake up ideas and pictures soon. But until then, here are a few YouTube how too videos I found.